Salad dressing from a bottle will never taste as good as a simple homemade dressing. A touch of honey and some good balsamic vinegar make this salad dressing flavorful yet light. I make a batch of this about once a week and keep it in the fridge next to the greens. With such a flavorful dressing a little bit goes a long way, so be sure you choose the best quality ingredients you can. Honey balsamic salad dressing is a great choice for the summer months, but if you are like me and can’t wait, go ahead and make it now! 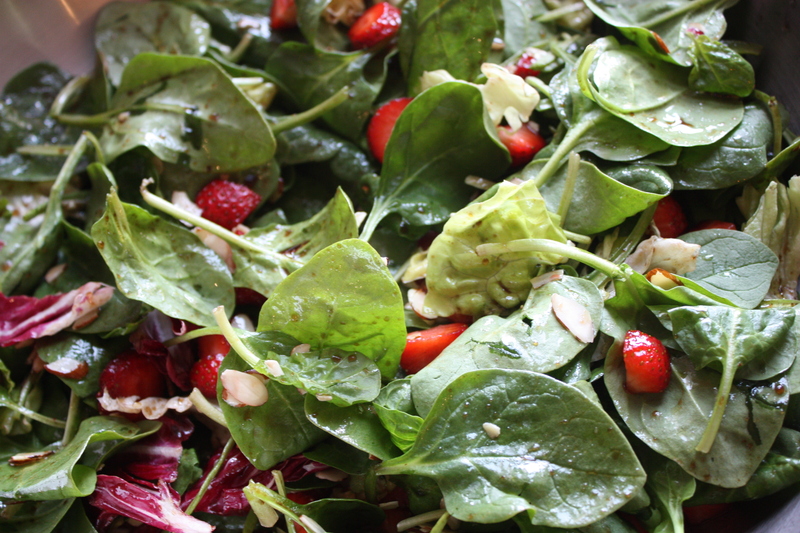 My favorite salad to make with this dressing is a simple salad with baby spinach, sliced strawberries, and slivered almonds, as I made for this year’s Easter lunch. All of the flavors and textures work really well together and make a gorgeous presentation. Put the balsamic vinegar, honey, and a pinch of kosher salt in a bowl and whisk to combine. Slowly add the olive oil while whisking until incorporated. Alternately, you can put all the ingredients in a sealed bottle and shake them up to combine. Enjoy over many fresh salads- this batch should last you at least 3 family sized salads, or several personal sized ones. Did you see my how to prepare artichokes video? If not, please check it out. I also shared some tips. Artichokes are simple to prepare once you learn how! Have a great weekend! I will be sure to update when I can- the Cherry Blossom 10 mile race is on Sunday. I can’t wait! Please share your favorite salad dressing recipe in the comments! I can’t agree with you more that bottled dressing never tastes as delicious as homemade. I have never been a fan of salad dressing – except for a few caesar’s. Alot of people have told me to try honey and balsamic, but I haven’t yet. I have been using a dressing I found on ohsheglow’s that has maple syrup, but I am thinking I will sub honey now! this sounds like such a good salad dressing! i’ve really been trying to work on making my own at home since “salad season” is beginning, and this is definitely going to be a winner! I agree! I love simple homemade dressings. I stick to them or salsa to top salads. I never buy the bottled stuff. Happy weekend! I totally agree…I always make my own dressings! So much more flavah!! That dressing sounds so tasty! You always have the best recipes! Dressing sounds ah-mazing! I might make this tonight!! I love making my own salad dressings. My favorite I make is one with greek yogurt, low-fat butter milk, sea salt, pepper and garlic salt. Super easy to make and delicious. what are the exact measurements for everything you use in your dressing? @Cat, Thank you and thank you! Good luck to you too! I will be wearing a white shirt with a strawberry on it that says “RhodeyGirl Tests” on it so if you see me please say hi!!! Good luck this weekend!!!!! So weird, I just google blog searched for a balsamic dressing and this came up. I knew you looked so familiar when I saw your pictures, I went to PC too! so ironic that you posted this today and I searched it today! @Nicole @ making good choices, So coo1! Hi!!!! I just went and checked out your blog- HI!!!!!!! You look familiar to me too! Small world! You have some of the best simple recipes around and I’ll definetly try this one out since I eat a salad about 3 times a week. Good luck in the race Sunday. Congratulations on your race, Sabrina!!!! great time + pace!! You must try the honey balsmic dressing with….mixed salad greens,dried cranberries,thinly sliced apples and a few walnuts. Absolutely yummy!